We have just entered the new millennium. World War II has been over for more than 55 years. Many of the men who fought in the war and survived have passed away. The survivors are, or nearing, 80 years old or older. Soon there will be no one left to ask about this amazing and horrifying period of history - no one who was actually there. It is a blessing that my father was able to complete his biography before he passed away. To that I can add, briefly, the following: Dad was a very hard working man who considered himself fortunate to have had the success he did. He started work in the mail room of the Pentagon and retired as Principal Deputy to the Assistant Secretary of the Air Force. He loved travel, golf, naps, and had a wonderful smile. Dad went into the hospital on the 16th of November, 1998 complaining of back pain and died on December 16th of bone cancer. Mom, Judy and I were at his bedside. He had led an amazing life. 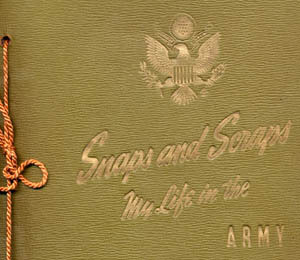 The majority of the photos and information contained in this Web site were taken from my father's wartime scrapbook & other materials my father brought back from Italy, as well as verbal stories, dad's biography, and conversations and correspondence with Charles Laynor, the tail gunner, Zenas Plymale, the engineer/top gunner, and the family of James "Red" Springer, the radioman/waist gunner. Other information has been provided by the 461st Bomb Group Web site, the Air Force Museum, and the National Archives, all of which can be found on my links page. A special thanks to Rob Hoskins and Frank O'bannon of the 461st Bomb Group Web site. Both of these gentlemen were very helpful in the early stages of my research when the task seemed so daunting. It is my intention to honor the men who flew the B-24 during WW2. This is a resource site, and I accept no advertising, and sell no products. I have made every attempt to get permission from all sources and to give credit accordingly. However, I have used a few images for which I do not know the original source, and a few which I have credited, though I was unable to contact the original contributor. My apologies to anyone who feels I have used their material improperly. Please contact me so proper credit can be given, or an item removed. All artwork, including animated Gifs, is my own. I have provided what information I have been able to gather regarding this crew, and attempted to provide enough additional information to give some background to their experiences. There is a wealth of information on the Web which can provide far greater depth, as well as many fine books. I have listed many of these on my LINKS page and there is much more to be found by searching the Net. Many of the links can also be found within the body of this site where I have felt it particularly pertinent.